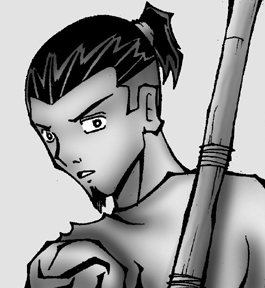 QUOTE: "They know about the mark"
Once, Gojinn's life was simply a routine. Living in his tiny village, Gojinn never thought about what may be beyond the ocean waters. Though young, he had already mastered the arts of smithing weapons. Suddenly, Gojinn was making blades stronger and more dense than the elders had ever seen. His fiance, Mei, was a blessing that had come to their village some years ago. Gojinn's best friend, Hanta, became the village's best hunter. And Gojinn's sister, Kira, trained in the arts of combat like no other. He was content. And then his whole world was turned upside down. 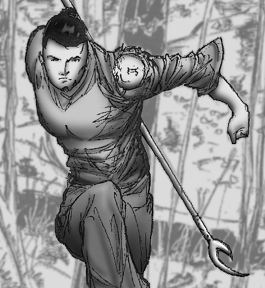 Gojinn's newfound strength was a product of the mark that mysteriously appeared beneath the skin of his arm. The "Mark of the Jinn, " he feared. 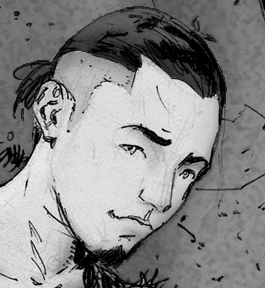 Gojinn kept his mark hidden beneath his sleeve, refusing do anything that would require him to remove his shirt. Eventually, Mei discovered Gojinn's mark. With his life in his simple village destroyed, Gojinn sets simply to escape. With no destination in mind, he simply runs. With his deadly sister and friend hot on his trail. When he stumbles into a village that his people have never visited, Gojinn meets Ningai, and realizes that the world may be a much bigger place than the he knew.